Oh goodness.. I'm AHEAD of schedule this month :) Dang I am proud of myself... maybe I deserve a margarita... hahaha! 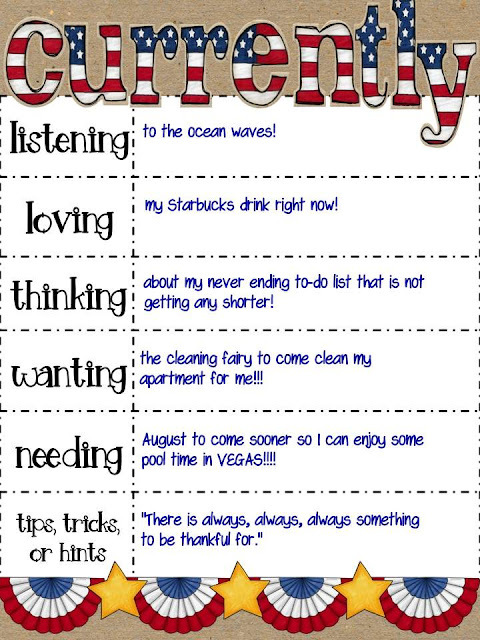 Here is my July Currently that I linked up with Oh' Boy 4th Grade! I can't complain... it's summer and I am working on new TpT products and my next blog series. I am enjoying life needless to say! I am LISTENING to the waves crashing only a few feet away. I am LOVING that I picked up a Starbucks Iced Latte on the way down to the beach. I am grateful that I live only two blocks from the beach so I can multitask AT THE BEACH. It doesn't get much better than this. While sitting on the beach, I am THINKING about my long to-do list which is full of half started TpT products, a list of blog thoughts/series/ideas, and many chores needed to be done at home. Which leads me to me WANTING a cleaning fairy to come take care of all of my chores at home... laundry, dishes, cooking, cleaning... ugh. More over, I am NEEDING August to come here ASAP. I have trip with my boyfriend planned to Vegas for the first week of August, and I cannot wait to be sitting by the pool with a nice drink in hand. 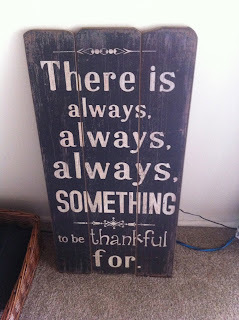 Lastly... remember that "There is always, always, always, something to be thankful for." Wow! That close to the beach?!?! That's so awesome! You are right. There is always something to be grateful for. I like your blog's color scheme. I need a cleaning fairy, too! Can they clean and organize?!? Oooh I want your Starbucks and your holiday in August!! Love your tip! That is soo true, and your new sign is adorable! "I Want to Listen To..."
Adapting Graduation Ceremony for my Kiddo's! Peek-A-Boo, Where is the Graduate?